What are some of the best practices for contacting support? If you need help - we've got you covered. That being said, there are a few things you can do to make sure we've got everything we need to help out. This information can give us a huge leg up in finding a resolution for your issue. Without it - we're left to trying to guess on things, or reply asking for more information. 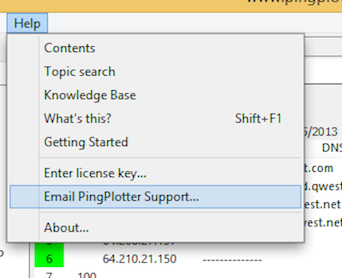 Emailing from PingPlotter or MultiPing is very easy - and at any time, you're only four clicks of the mouse, and a little bit of typing away from submitting a detailed support ticket! 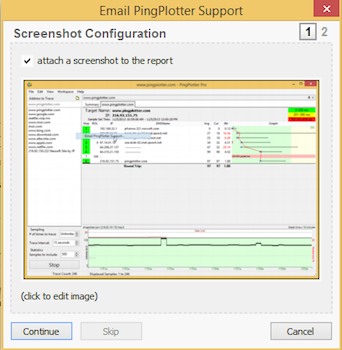 Step #1 - From the toolbar - go to "Help > Email PingPlotter Support"
Step #2 - Attach a screenshot. 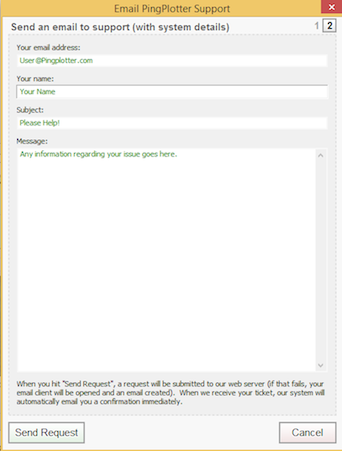 Step #3 - Fill out the required information, and hit "Send Request." If you're having network problems, and you'd like our advice - please try and give any detailed information you may have about your issues, the effects on other applications, and anything else of interest you may have found by following the advice in our Pinpointing the Problem article. If you're reaching out for advice on network issues - it always helps to send us a .PP2 file (from either PingPlotter Standard or Pro) that is at least 10 minutes long (preferably longer - all the way up to 24 hours). If you're emailing in about an error, or a capability that isn't working in a way you'd expected - please try and elaborate on what's happening, and any steps you took to get to that point. Within 1 to 3 minutes of submitting a ticket, our system will email you with a confirmation that we have received your request. It's very important to make sure you get this, as it's your way of knowing that your email went through successfully. If you're not initially seeing it, make sure to check any junk/spam folders you may have set up. If you've followed all of these steps, and you're still not seeing any confirmation or response, there are some additional steps you can take, which can be found here. Give us Time to Work on Your Request. Our office hours are Monday through Friday, 9am to 5pm, U.S. Mountain Time (16:00 to 00:00 GMT). We love helping you, and answering your questions is one of our top priorities. We try to work on these requests as soon as we receive them. We often reply within an hour or two, and love to do so, but sometimes it can take a day or so.